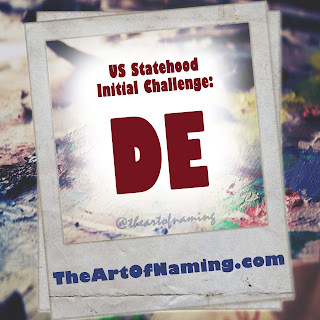 Way back in January 2015, I began a little series on Instagram that featured the two-letter abbreviations of states within the USA. 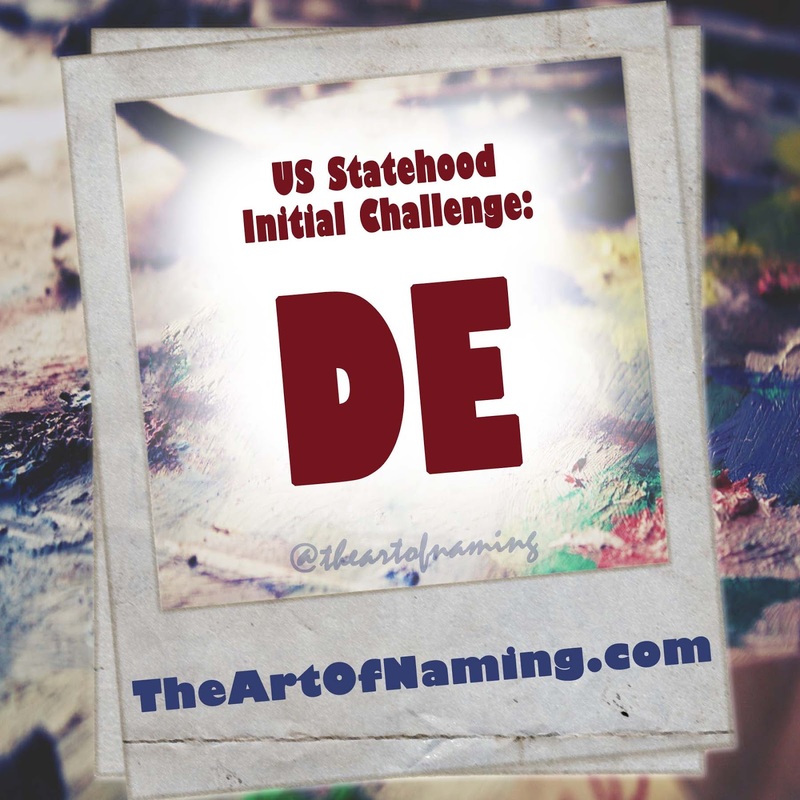 I started with Delaware, the very first state that was given official statehood, and then I continued on from there. This has been a very long and slow series, but finally, two years later, we've reached the halfway point. With each post, I would ask you to name a boy and a girl using those initials as the basis. And each time, I would also post my name choices for those letters. Let's take a look back and see how my impulse naming panned out. Over time, did I actually create a family tree of names that might match nicely? Or did those names vary greatly with each state? How many times might I have repeated a name? 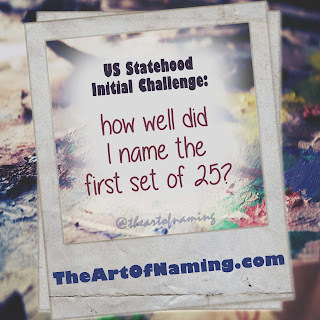 I'm willing to bet that my general naming style fluctuated greatly, but, if you've followed my blog since the beginning, perhaps you'd find me somewhat predictable. If you'd like to play along with this name game, you can either browse through my Instagram posts, or visit this album on Facebook. What are your thoughts about my choices? Remember, these are spread out over 2 years and I chose them rather spontaneously with each post. I didn't go back to see what other names I had used previously. I simply went with what I liked at the time. As a result, there are a few repeats. 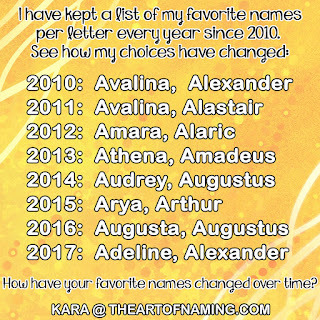 What these names show me is that some weeks I was feeling bold, so I would pick something more unusual like Hettienne, Gesine, Vadden, Averill, Cressida, Vella or Avara. Other times, I was in a bit of an old-fashioned mood so I went for names like Irving, Gregor, Marlon, Mavis, Malcolm, Mabel, Lawrence, Ida and Laurel. And sometimes I would play it safe and go for something common and classic, such as Oliver, Alexander, Thomas, Lily, Caroline, Abigail and Isabelle. If I had to choose one name that does not belong here, it would be Kensington. It's much more trendy than the rest and isn't usually my kind of name. I might also toss Stetson in the same category. Overall, if there weren't any repeats, I'd say this would be quite an interesting family tree to be part of. What do you think? Did I choose any that catch your eye? Are there any that just don't belong? 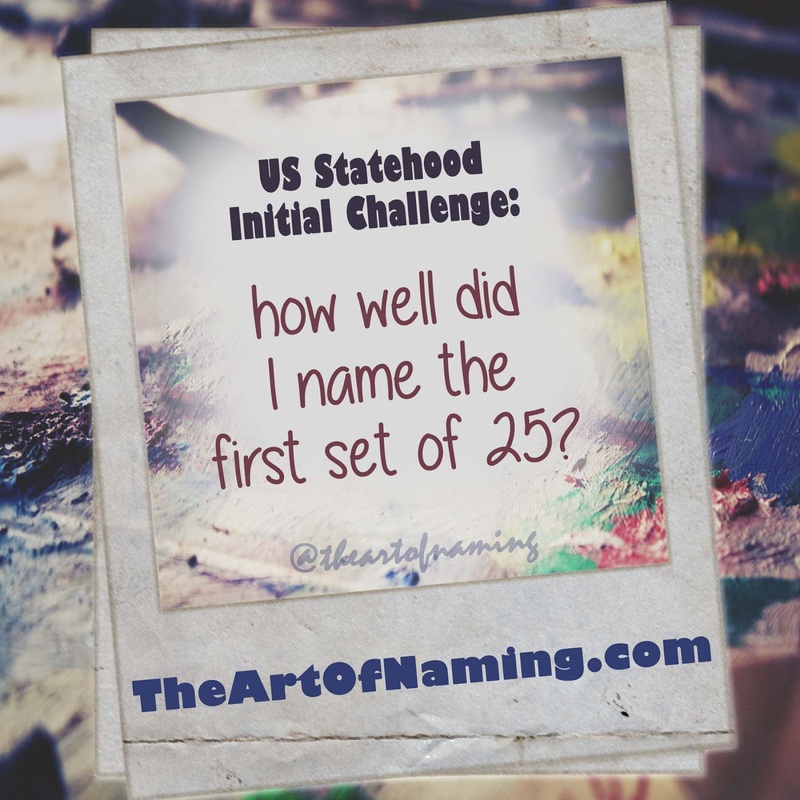 Whenever the statehood series is finally concluded, (even if its another two years from now), I will post that set of 25 twins and see how they match up. Hopefully I won't repeat any from here on out but I can't guarantee it! Stay tuned! 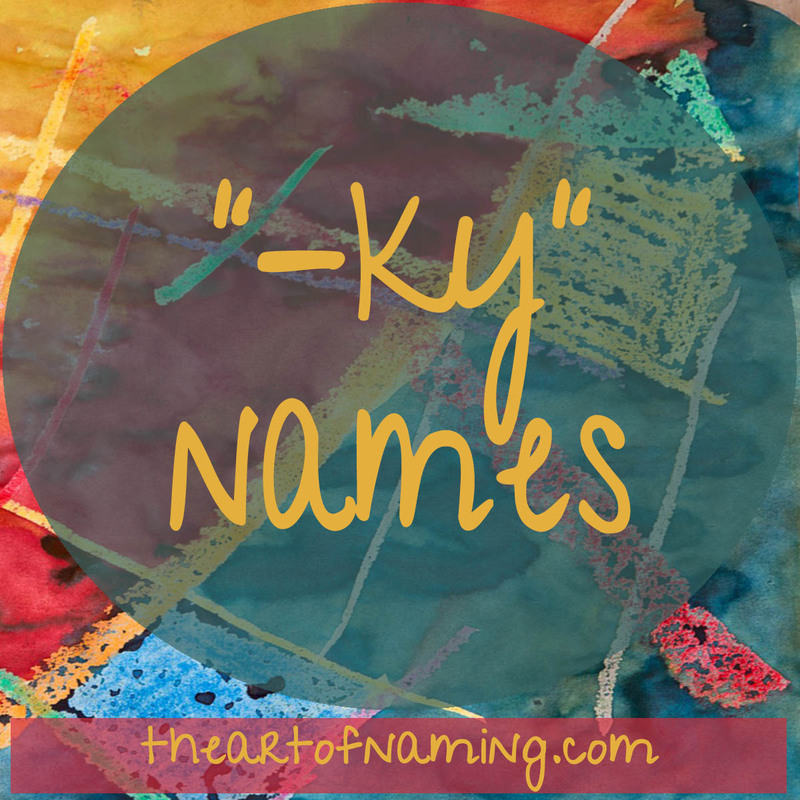 This name comes from our list of names ending with the letters "-ky". If you saw that article, you know that this is a very limited club of names, but there are definitely some cool choices. One of the coolest options from the list is Rocky. Rocky is given as a full name, but it is also treated as more of a nickname. It could be considered a diminutive of the name Rocco which is a Germanic name from the element hrok which means "rest". Rocco is the patron saint of the sick. However, as you may know, Rocky is not so much a saint as a famous fictional boxer. The Rocky franchise of movies starring Sylvester Stallone as Rocky began in 1976 and is possibly the most well-known association with this name. Another association comes from the old cartoons "The Bullwinkle Show" and "Rocky and His Friends" both of which aired in the 1960s. These featured a flying squirrel named Rocky and his moose pal experiencing a variety of adventures. 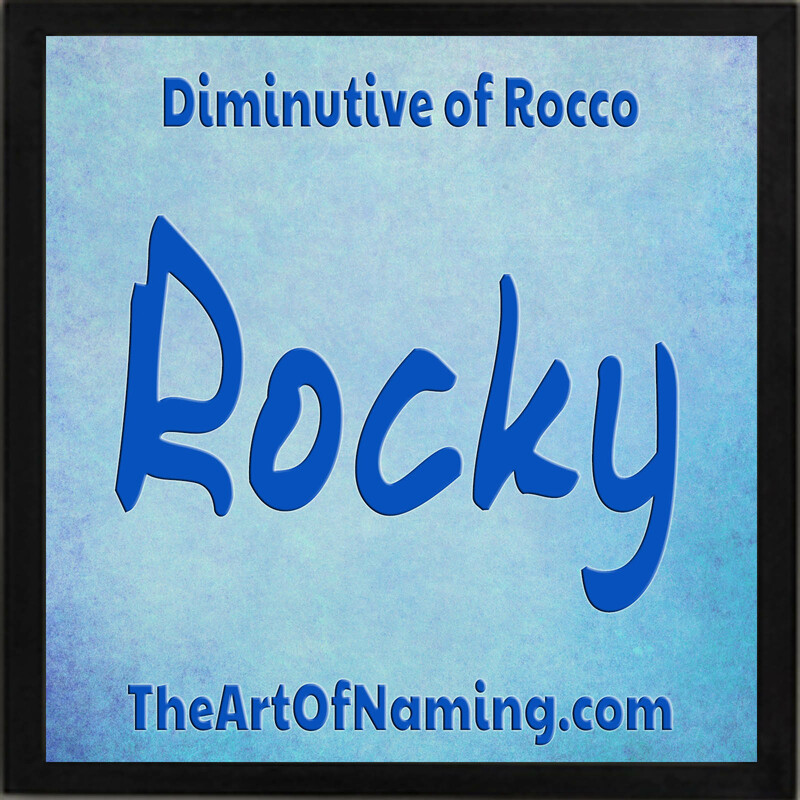 Interestingly, Rocky was short for "Rocket", which would definitely be a bold choice for a baby name today. As a baby name in the US, Rocky appeared on the charts in 1913. In 1942, it entered the Top 1000 chart and had a great year in 1957 with its record-high 911 births for a single year. It had its ups and downs but has mostly remained within the Top 1000 except for the years 1999, 2002, 2004 and 2008-2012. Nowadays, Rocky still lingers in the #900s as a viable option for usage on a modern boy. There have even been a handful of female Rockys, including 6 in 2015, but mostly given between 1949-1984. Do you know anyone named Rocky? These may be a bit unconventional and over-the-top, but they work if you strictly remain in the same tough, nicknamey vein as Rocky. What would YOU pair with Rocky? 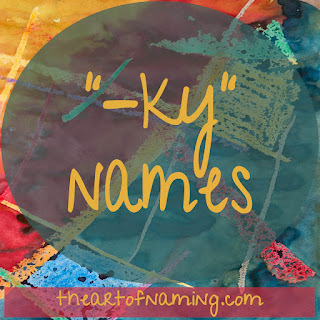 Names Ending With The Letters"-ky"
We've covered nearly half the alphabet already. Sure, there are some letters that just won't fit into this category, so we have skipped a few of them. But here we are, arriving at letter K for a compilation of "-ky" names! Can you think of any that I missed? Would you use any of these?